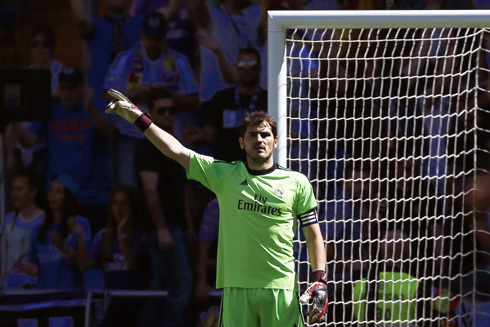 The Santiago Bernabéu hosted its last game of the season, as Real Madrid collected a somehow meaningless 3-1 win over Espanyol and finished 3rd in La Liga. The new Spanish champions are Atletico Madrid, who visited the Camp Nou and came out of the Condal city with a precious 1-1 draw. With that result, the Colchoneros secured the club's 10th league title with 90 points and managed to finish on top of Barcelona (2nd, 87 points) and Real Madrid (3rd, 87 points). 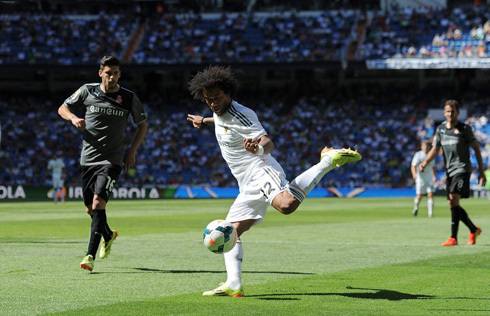 The Merengues reached their victory thanks to an opening goal scored by Gareth Bale and a brace by Alvaro Morata. The negative note of the evening came in a few mins before the kickoff, when Cristiano Ronaldo felt forced to abandon the pitch following a small relapse on his knee injury. However and according to the latest reports gathered right after the match, his presence for the Champions League final against Atletico Madrid on the next Saturday shouldn't be at risk. The first half had no goals being produced by neither side and we actually had to wait until the 64th minute of the game in order to see the home fans rising from their seats with good enough reasons to cheer for. Real Madrid broke the deadlock in a fast attacking play led by Karim Benzema, who found Gareth Bale running away from his marking in the centre corridor. Once the former Tottenham star got the ball on his feet and no defenders standing in front of him, he raced towards Espanyol's goalkeeper and beat him with an accurate right foot strike that sent Real Madrid into the lead. However and right after that second goal, it was as if Real Madrid turned off their switch and when that happens, the opponent side usually capitalizes on it. In the 90th minute of the game, Espanyol got to reduce the Merengues' lead to only one goal, after exploiting some really poor defending from the home side. The goalscorer was the Portuguese forward, Pizzi, who showed no difficulties in beating Iker Casillas from a close-range strike in the far post and after already having escaped Varane's marking. A few instants later, Espanyol had a good chance to equalize the game at 2 goals, but a good defensive effort from Luka Modric allowed the Merengues to hold on to that score for at least a few more seconds. The visitors then earned a final corner-kick in the dying minutes of the game, but it would be Real Madrid scoring the last goal of the evening, once again through a lightning-fast counter attack. Just as it had happened in the previous goal, it was Angel Di María providing the assist and Alvaro Morata easily finishing it off with an empty net in front. The final result was set at 3-1 and Real Madrid finished La Liga in 3rd place, with 87 points, 104 goals scored and 38 conceded. As a direct consequence of being 3rd, the Merengues will have to go through the Champions League playoffs rounds next season (somewhere around July and August), but only if they end up not beating Atletico Madrid and winning "La Décima" on May 24. The reason for that is that the UEFA Champions League winners earn a direct entrance into the group stage. Attackers: Di María, Bale, Benzema. Cristiano Ronaldo next game for Real Madrid will be against Atletico Madrid, in the UEFA Champions League final in Lisbon, scheduled for May 24 (Saturday). You can watch Juventus live stream, Real Madrid vs Atletico Madrid, Spain vs Bolivia, Derby County vs QPR, and Indiana Pacers vs Miami Heat, all games provided from our sports streaming section.